As the Fall colors brighten the hills here in Southeast Ohio, the Monday Creek staff invites you to join us on a tour of the Monday Creek Watershed. On this year's tour we plan to visit some of the reclamation and historic sites found throughout the area. We will have personnel on hand to describe the projects and answer many of your questions. The tour will take place on Friday, October 15 from 10:00am until 3:00pm. To assist us in planning for transportation and lunch, we ask that you please RSVP to the Monday Creek office by October 8, 2010. 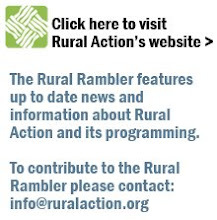 We can be reached by telephone at (740)394-2047 or email at eliseg@ruralaction.org. We will meet the day of the tour at the Monday Creek office at 115 West Main Street, in New Straitsville. - Lost Run Headwaters Project – To neutralize the acid from past mining in the Lost Run Subwatershed, the US Forest Service is establishing positive drainage, closing subsidences and improving wildlife habitat. In addition, several open limestone channels, two steel slag leach beds and a water supply lake are being constructed. Hocking College students in the Heavy Equipment Operators course are performing the work. -Upstream Rock Run Watershed Restoration Project – This project is within a 300-acre drainage that has been heavily impacted by past mining activities. The project involves opening approximately 16 blocked drainages and creating a small (3-acre) pond, ephemeral pools and a meadow. A handicap accessinble trail will go around the pond with benches and interpretive signs in areas where wildlife can be viewed. -Old Stone Church Historic Site - This is the church ruins and cemetery of a congregation that that dates back to 1825. The building that is now falling to pieces was built in 1839. It was a magnificent structure for its day and is one of the landmarks of southern Perry County. -The Ora E.Anderson Nature Trail/Rutherford Wetland – This nature trail was once part of the Columbus and Hocking Valley Railroad and was also known as the Mineral Railroad. This branch spur was built in the 1870s to connect Nelsonville to a new town site named New Straitsville. Rutherford Wetland was formed as the railroad bed caused water to backup onto farm fields.